Outwit The Game You Hunt! Hunter's Edge is committed to producing award-winning innovative products for big and small game hunters to enjoy. That commitment, was born from countless hours of in-the-field testing, personal experience, as well as adhering to customer feedback on their hunting adventures. We stand 100% behind the products we manufacture, and promise to continue to develop cutting edge one-of-a-kind products year after year, to help you become successful with each trip afield. When planning your stand location, make sure you know the primary wind direction. Cover Scents and Odor Elimination products are necessary to destroy and cover unwanted odors. However, its still important to place your stand down-wind, to avoid unwanted scent dispersal into your hunting area. If you are not 100% satisfied with the purchase of any Hunter's Edge product, simply return the un-used portion (liquid products) within 2-weeks of the purchase date, to the address below with a copy of your sales receipt and reason for the return. We will refund your purchase price less shipping and handling fees. If your returning decoys or calls, Hunter's Edge will determine whether or not these items were damaged outside of normal usage, and will issue a refund based on our expert evaluation. Please allow 7-10 days for refund processing. President / CEO, and developer of the companies first product B. A. TREE Pine Cover Scent in 1987. Since that time, Jamie has developed 47 additional products in scent, call and decoy lines. His passion for the outdoors was born from his country boy raising in "LA" Lower Alabama, where he learned to hunt at an early age through the watchful eye of his father, Henry Ford Bulger and five older brothers; Roger, Steve, Terry, Randy, and Mitch Bulger. Necessity, is still the driving force behind his inventiveness, and will continue as long as there are small and big game species to hunt. Cole loves selling Hunter's Edge Products. He is also an outside-of-the-box thinker, which will in the future become a tremendous asset for the company. More geared for fast action, Cole loves wing shooting where he can unload shot after shot at fast flying doves, ducks and quail. However, he is most passionate about Motocross Racing. 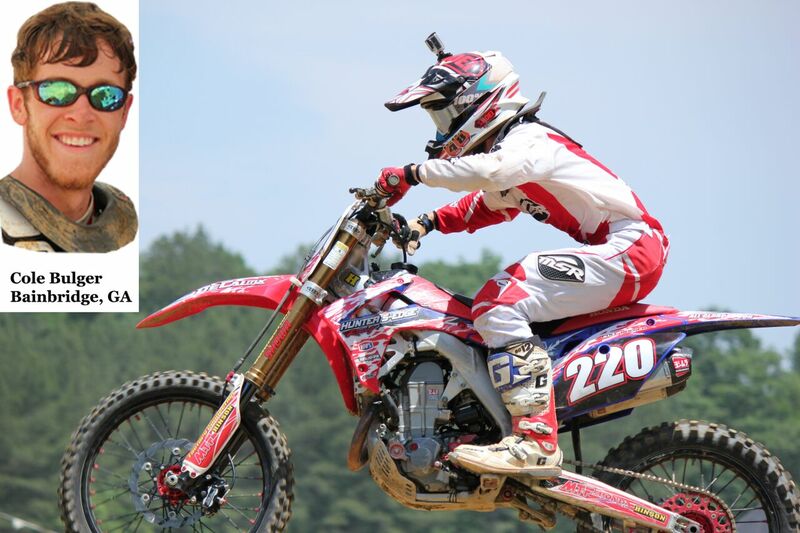 In 2014, he placed 1st in the Southeastern Amateur Regional 250-Division Race, which qualified him for the coveted Loretta Lynn's Motocross National Amateur Division Race in Hurricane Mills, Tennessee. Maybe in the near future, Cole will decide to put all that Motocross energy into Hunter's Edge. By the way, his number 220 represents Galatians 2:20 which reads; I have been crucified with Christ. It is no longer I who live, but Christ who lives in me. And the life I now live in the flesh I live by faith in the Son of God, who loved me and gave himself for me. Hunter plays a key role in the day-to-day operations and infrastructure of Hunter's Edge. His youthfulness and College Business Experience, has positioned the company for extensive growth in all categories throughout the next three to five years. Hunter, is also passionate about hunting and developing new products to help drive future growth of the company. He harvested his first buck at age nine, and when he was 21, spent two months in Alaska as a cleaner/packer on a Dall Sheep and Moose hunt with his Uncle Troy Kitchel, of Kitchel's Alaska Guide Service. His Dad says, the hardest job he has is keeping him out of the woods! Hunter's life verse is Matthew 5:16 which reads; In the same way, let your light shine before others, that they may see your good deeds and glorify your Father in heaven.